'Summer time' magnificently demonstrates Rupert Bunny’s skill as a draughtsman and his masterful handling of large-scale composition. 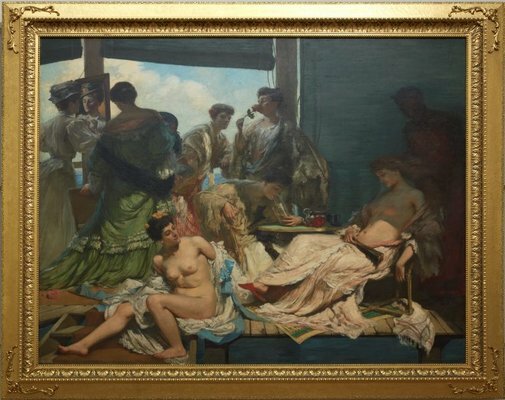 Exhibited at the New Salon in 1907, the painting epitomises the leisured spirit of the ‘Belle Époque’, elegantly capturing seven voluptuous women lounging inside a bathhouse, sipping iced tea and inhaling the intoxicating scent of freshly plucked roses. Bunny modelled each of the figures on his wife Jeanne Morel, who sat for numerous paintings from this period. Signed l.r. corner, yellow ochre oil "Rupert C.W. Bunny.". Not dated. Christopher Allen, The Weekend Australian Review , 'What lies beneath? 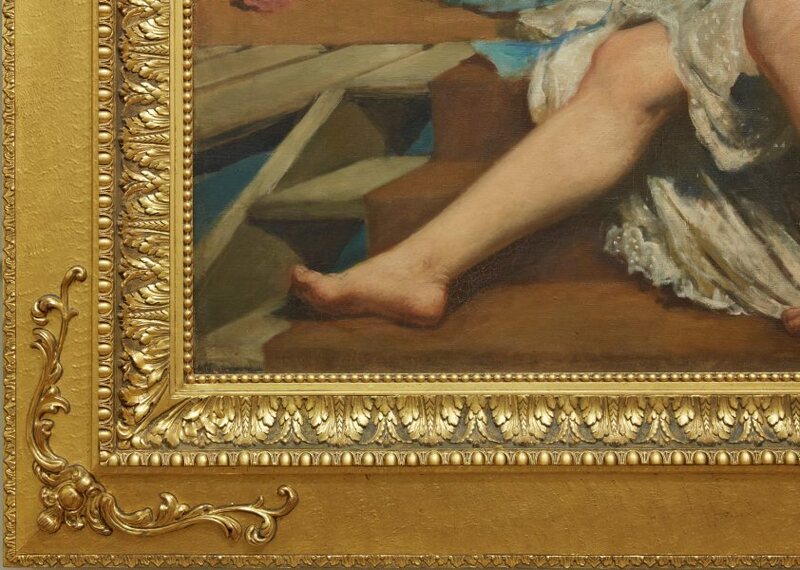 Rupert Bunny comes in for close scrutiny in a new survey exhibition', pg. 14-15, Canberra, 12 Dec 2009-13 Dec 2009, 14. Annabel Baxter, Look , 'Guiding the children', pg. 10-11, Sydney, Feb 2004, 11 (colour illus.). Deborah Edwards, Look , 'Rupert Bunny: An exotic in the history of Australian art', pg. 28-32, Sydney, Nov 2009, 32. Deborah Edwards, Look , 'Beauties of the Belle Epoque in Australia', pg. 16-18, Sydney, May 2011, 16 (colour illus. ), 17, 18. Anne Gérard, Look , 'Oz arts: our painters in the Parsi Salons', pg. 37-39, Sydney, Dec 2006-Jan 2007, 39. Barry Pearce, Art Gallery of New South Wales handbook , 'Australian', pg. 13-35, Sydney, 1988, 20. Barry Pearce, Parallel visions: works from the Australian collection , 'Introduction: Convergent Spirits', pg. 10-19, Sydney, 2002, 15, 22, 23 (colour illus. ), 26, 142, 147. Mark Pennings, Brought to Light: Australian Art 1850–1965 from the Queensland Art Gallery collection , 'Art for the Bourgeois Dreamers of Paris. Rupert Bunny Bathers', pg. 98-101, Brisbane, 1998, 98, 100, 101 (illus.). Dr Barbara Penson, Look , 'On being a Gallery member: Share the knowledge and the fun', pg. 12-13, Sydney, Nov 2008, 13. Ursula Prunster, Australian art: in the Art Gallery of New South Wales , 'Home and abroad', pg. 73-74, Sydney, 2000, 74, 88 (colour illus. ), 89 (colour illus., detail), 300. Michael Tasker, Look , 'Anatomy of an exhibition', pg. 28-31, Sydney, Jun 2011, 29 (colour illus., detail). Photograph has Senior Conservator Simon Ives cleaning the painting. David Thomas, Art Gallery of New South Wales Quarterly , 'Rupert Bunny', pg. 550-575, Sydney, Oct 1970, 553-554, 559 (illus). The Art of Rupert Bunny , Parkes, 1991, 58, 59 (illus.). Art Gallery of New South Wales Annual Report 2000 , Sydney, 2000, front cover (colour illus. ).